In the art of the Middle Ages and Renaissance, the Virtues were often personified by human figures carrying identifying attributes. Charity typically holds one or more children. As represented by Mino da Fiesole, a contemporary of Desiderio da Settignano and Antonio Rossellino, Charity and a companion piece Faith appear as slender young girls in clinging, layered gowns with fine pleats. Their heavy mantles are carved in distinctive, angular folds. Typical of Mino's style is the fine, precise, sharp-edged treatment of textile folds and locks of hair, giving these features an ornamental quality different from the softer approach of Desiderio and Antonio Rossellino. Set in arched niches, the figures must have been intended as part of a monument combining architecture and sculpture, probably a wall tomb inside a church. The Virtues would represent reasons for the deceased person's good memory on earth and hopes for Paradise. Faith and Charity stand on bases treated as little banks of clouds, as if they were already in heaven themselves. Hope, the third theological Virtue mentioned in Saint Paul's first letter to the Corinthians, might have completed such a group. Purchased 1864 by Charles Timbal [1821-1880], Paris; sold 1872 with his collection to Gustave Dreyfus [1837-1914], Paris; his estate; purchased 1930 with the entire Dreyfus collection by (Duveen Brothers, Inc., London, New York, and Paris); purchased 15 December 1936 by The A.W. Mellon Educational and Charitable Trust, Pittsburgh; gift 1937 to NGA. Perkins, Charles. Historical Handbook of Italian Sculpture. London, 1883: 402. Vitry, Paul. "La collection de M. Gustave Dreyfus: I. - La Sculpture." Les Arts 72 (December 1907): repro. 15, 20. Cortissoz, Royal. An Introduction to the Mellon Collection. Boston, 1937: repro. opposite p. 26. Jewell, Edward Alden. "Mellon's Gift." Magazine of Art 30, no. 2 (February 1937): 83. Preliminary Catalogue of Paintings and Sculpture. National Gallery of Art, Washington, 1941: 228, no. A-6. Book of Illustrations. National Gallery of Art, Washington, 1942: 253, repro. 231. Duveen Brothers, Inc. Duveen Sculpture in Public Collections of America: A Catalog Raisonné with illustrations of Italian Renaissance Sculptures by the Great Masters which have passed through the House of Duveen. New York, 1944: figs. 120-121. Paintings and Sculpture from the Mellon Collection. National Gallery of Art, Washington, 1949 (reprinted 1953 and 1958): 156, repro. Seymour, Charles. Masterpieces of Sculpture from the National Gallery of Art. Washington and New York, 1949: 177, note 27, repro. 98, 100. Summary Catalogue of European Paintings and Sculpture. National Gallery of Art, Washington, 1965: 162. European Paintings and Sculpture, Illustrations. 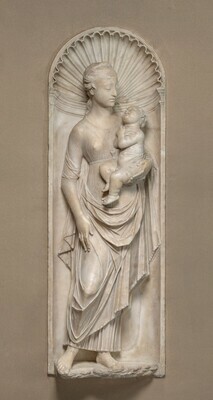 National Gallery of Art, Washington, 1968: 143, repro. Walker, John. National Gallery of Art, Washington. Rev. ed. New York, 1984: 624, no. 963, repro. Kopper, Philip. America's National Gallery of Art: A Gift to the Nation. New York, 1991: 108, color repro. National Gallery of Art. National Gallery of Art, Washington. New York, 1992: 288, repro. Sculpture: An Illustrated Catalogue. National Gallery of Art, Washington, 1994: 152, repro. Moskowitz, Anita F. Forging Authenticity: Bastianini and the Neo-Renaissance in Nineteenth-Century Florence. Florence, 2013: 54.